I suppose this is technically an addendum to my last post about the signet rings, but I figured it merited its own mention. 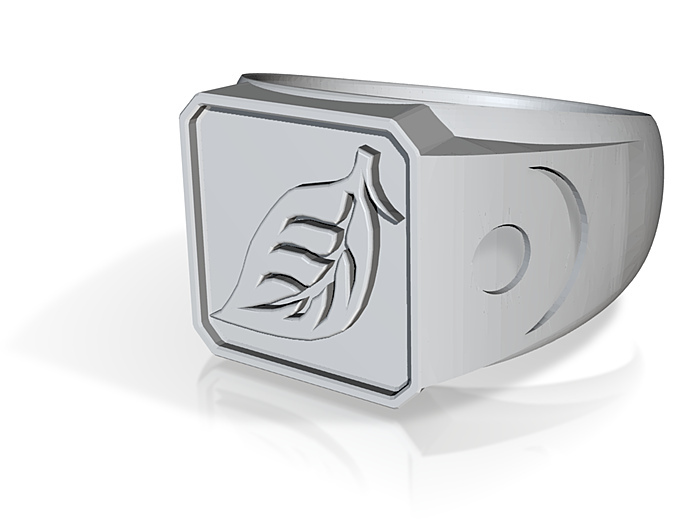 I now have Moonkin Druid signet and slim rings in my Shapeways store, Tish Tosh Tesh Toys. Ah, that’s the full set now. Back to Zomblobs! It’s “Cyber Monday”, and among other sales out there, Shapeways is having a 15% off sale. 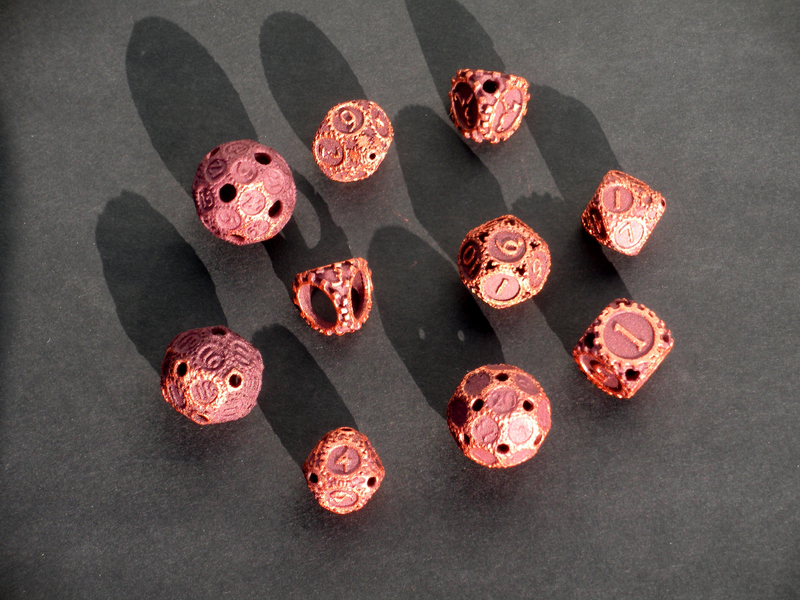 That means my Gearpunk dice are on sale, as are the World of Warcraft Druid signet rings. They are rejiggering the pricing around a bit as well, so the prices are going to be changing in my shop, too. No more of the nice progression of price points I planned out, no, it’s going to be a mess of weird numbers. That’s the bad news. The good news is that all the prices are going to be coming down a bit. I’m happy about that. 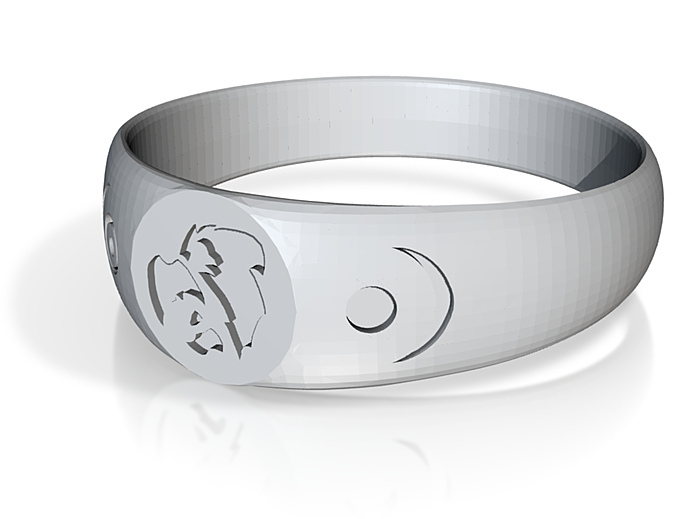 Lower prices, 15% sale… it’s a good day to investigate Shapeways. 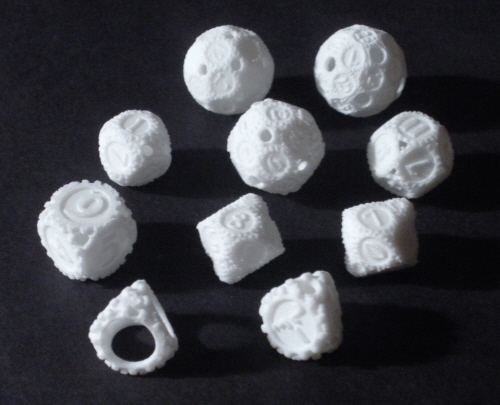 …and there’s the main Shapeways page. 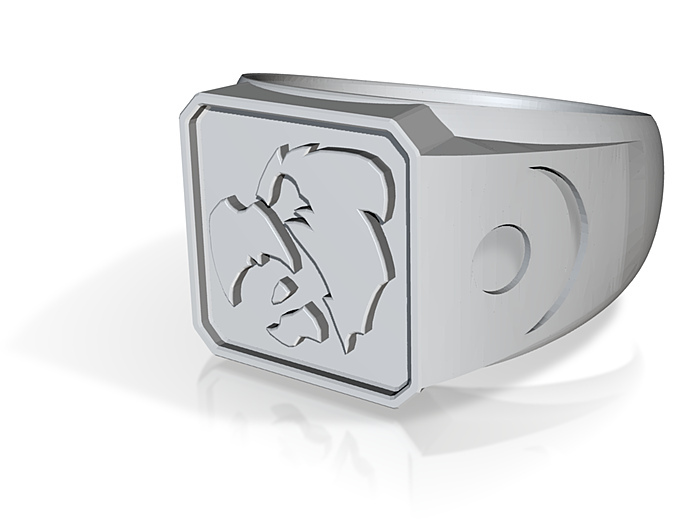 I now have the Resto and Cat form rings up for sale as well. Sorry they are late, but hey, sale day is a good day for them, right? 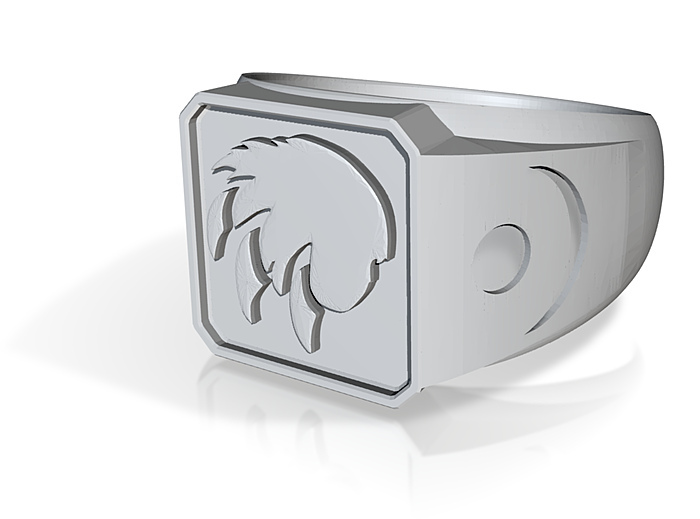 Moonkin rings are in the pipeline, hopefully available in the next few days. I used RIT cloth dye (the white printouts are actually a nylon plastic, and the RIT dye work on nylon), a plastic spoon and a plastic cup. 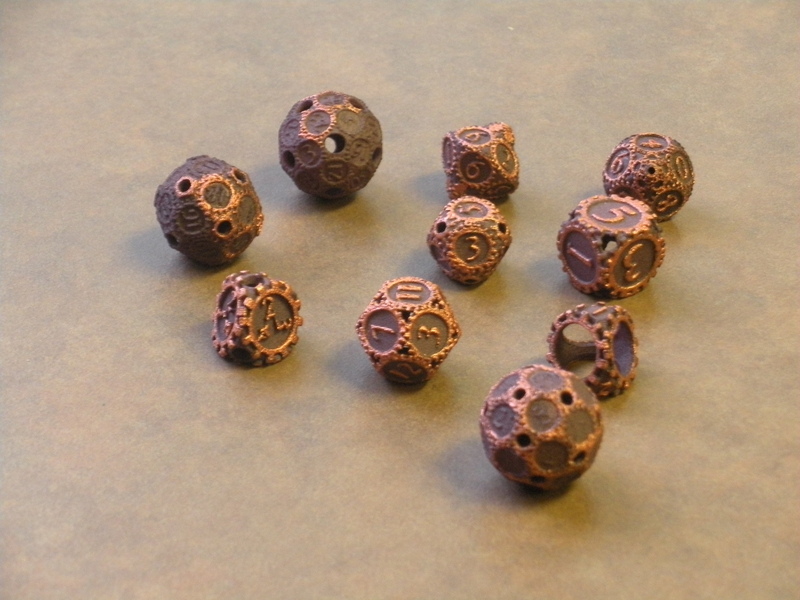 I never did really get the water boiling (I just used hot tap water and 30 seconds in the microwave every six minutes or so), but I kept stirring the dice in the hot water for about a half hour. In retrospect, I probably should have dyed them again to get a darker color (and I should have used a brown instead of black, which just turns out purplish), but they are dark enough to contrast well with the bronze acrylic paint I’m using to pick up the highlights. …they do look better under different lighting, and in person. Oh, and I finally pulled the trigger and bought RIFT from Steam’s sale this morning. Maybe I’ll play it sometime next year. I do want to give it a shot, but life is kinda busy at the moment. Welcome to the latest sneak peek at the current state of the Zomblobs! project. This is a unit card for one of the Zomblob units. Each unit will have a miniature, a card and some dice to keep track of game data. The units will play on a hex grid by default, but the game engine can convert readily to a gridless system. 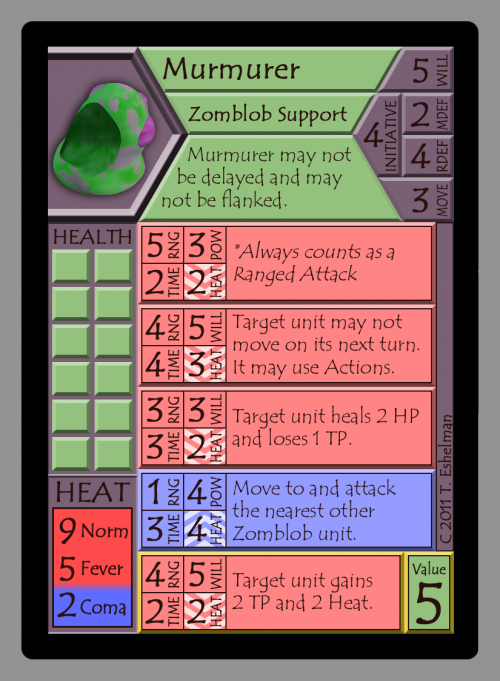 The core game that I’m making will consist of six units for each of the three breeds, Zomblob, Feral and Aspirant. I’m in the middle of something at the moment, so I’m not going to dig a lot into much of this, but I’ll do a proper writeup of it over the next few days. 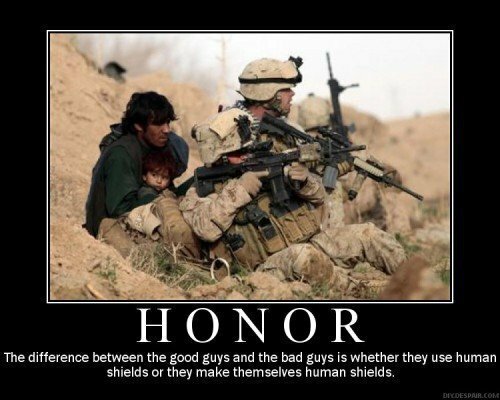 I just wanted to get this out there and see what sort of impression it leaves. It’s not exactly final, as I want to tweak the visuals a bit for colorblind players, and I may tweak some of the values and effects. This is pretty close to what I’ll call my beta version of the game, though, and while the details might change on this particular unit, and the graphic design may change a bit, the mechanics are all where I want them. I turned 35 today. As I noted over on Google+, this means I’m officially eligible to be President of the United States. I’m not sure if that’s scary or a simple answer to the question of who to write in on the ballot. Maybe it’s both. Oh, and here, have a song to celebrate!